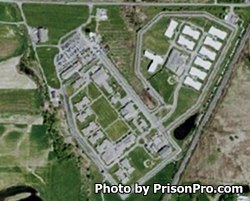 Greene Correctional Facility is located in Coxsackie New York. It is a medium security correctional facility. The current capacity of Greene Correctional Facility is 1,813 inmates. General population inmates are housed in open dormitories. Offenders who are difficult to manage are housed in a fifteen bed special housing unit or in 200 bed isolation unit called S-Block. While incarcerated offenders are encouraged to take educational courses to earn an adult basic education or GED. Inmates can also take additional college courses offered from the nearby Siena College and earn credits towards a Bachelor's Degree. Selected inmates at Greene Correctional Facility can work within the Correctional Industries program providing customer service for the New York State Department of Motor Vehicles; to be eligible to participate inmates must have a high school diploma or GED and over one year remaining to parole eligibility. Inmates can also receive vocational training in building and custodial maintenance, horticulture, masonry, printing, small engine repair, painting, computers, commercial arts, HVAC, and electrical systems. This facility also provides alcohol and substance abuse treatment to inmates. Visiting is limited to three adults, children under the age of five are not counted. General population inmates have visitation on Saturdays, Sundays and Holidays from 8:30am-3:30pm and from 5pm-9pm. You must arrive by 2:30pm for the morning session and by 8:30pm for the evening session or you will not be allowed to enter into visitation. SHU inmates have visiting on Saturdays from 5pm-9pm.